OMG Karen Newton! 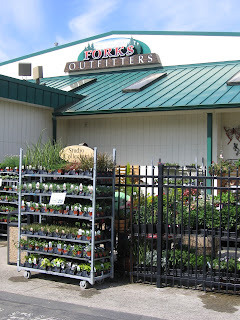 And there's actually a place called Forks Outfitters... What was with the flowers, though? Did you go in? Yes. Yes. 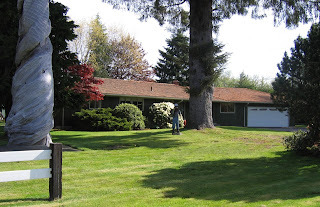 This is totally Karen Newton's house - you nailed it!! I want the high res of this so I can print it and frame it. 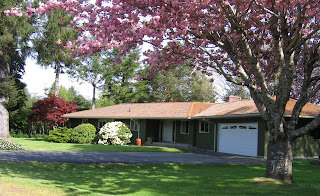 And, of course she has a crabapple tree. Mrs. Newton is classy!! I did go in and it was awesome. It's actually the outfitters (that sells clothes, shoes and equipment--including flowers and gardening stuff) that connected to the left by a grocery store and to the right by a hardware store. They were all joined so we bought morning breakfast and basketball shorts at the same time. classy indeed! This is awesome. Perfection. Were there any high heels sold in the store?